It’s the responsibility of the U.N. International Civil Aviation Organization to work out these matters, but it’s been dreadfully slow to either study or implement any rules, which is why the EU acted. Perhaps now it will move to avoid further conflict. The Senate unanimously passed a bill on Saturday that would shield U.S. airlines from paying for their carbon emissions on European flights, pressuring the European Union to back down from applying its emissions law to foreign carriers. The European Commission has been enforcing its law since January to make all airlines take part in its Emissions Trading Scheme to combat global warming, prompting threats of a trade fight. The Senate approved the bill shortly after midnight, as it scrambled to complete business to recess ahead of the November 6 congressional and presidential elections. 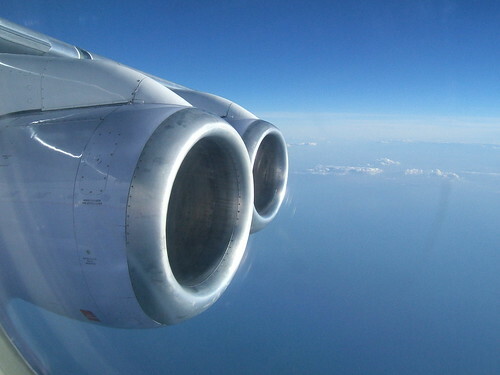 An airplane engine in flight. Photo by Peter Van den Bossche. Republican Senator John Thune, a sponsor of the measure, said it sent a “strong message” to the EU that it cannot impose taxes on the United States. “The Senate’s action today will help ensure that U.S. air carriers and passengers will not be paying down European debt through this illegal tax and can instead be investing in creating jobs and stimulating our own economy,” Thune said in a statement. So far, nearly all airlines have complied reluctantly with the EU law, but Chinese and Indian carriers missed an interim deadline to submit information required under it. China earlier this year threatened retaliation – including impounding European aircraft – if the EU punishes Chinese airlines for not complying with its emissions trading scheme. The dispute between China and the EU froze Airbus purchase deals worth up to $14 billion, though China signed an agreement with Germany for 50 Airbus planes worth over $4 billion during Chancellor Angela Merkel’s visit to Beijing last month. The Senate bill gives the U.S. transportation secretary authority to stop U.S. airlines from complying with the EU law. But new amendments agreed to during negotiations among lawmakers said the secretary could only do so if the EU trading scheme is amended, an international alternative is agreed to, or the United States implements its own program to address aviation emissions. This increases pressure on the U.N. International Civil Aviation Organization (ICAO) to devise a global alternative to the EU law. Annie Petsonk, a lawyer for the Environmental Defense Fund, said the bill will put pressure on the U.N. body, which has been working on a global framework for years. “Passage of the Thune bill amps up the pressure on ICAO to move swiftly to reach a global agreement on addressing aviation’s global warming pollution,” she said. Additional reporting by Barbara Lewis in Brussels; Editing by Vicki Allen.